Explore artistic hubs from across the globe with this fascinating infographic. What do Ernest Hemingway, Pablo Picasso, Eddie Van Halen and Alfred Hitchcock all have in common? These four are among a number of incredibly talented artists who emigrated abroad to find artistic success. Their stories are far from unique however, as the world of the arts is brimming with tales of immigrant success. Recent research has highlighted the tremendous impact that living abroad can have on your creativity. For example, a study conducted by psychologists William Maddux and Adam Galinsky in 2009 found that immigrants tend to consistently outperform native populations when it comes to creative problem-solving. So why is this? It appears that there is something inherently creative about moving abroad. Adam Galinsky, an expert on immigrant creativity, posits that “There is some sort of psychological transformation that needs to occur when people are living in a foreign country in order to enhance creativity. This may happen when people work to adapt themselves to a new culture." There are many reasons why an artist may wish to move abroad. In terms of artistic inspiration, nothing could top the hustle and bustle of a vibrant city. Many are lured by the great cultural hubs of the world, that may offer a better quality of life, reduced cost of living and of course, a lively arts scene. 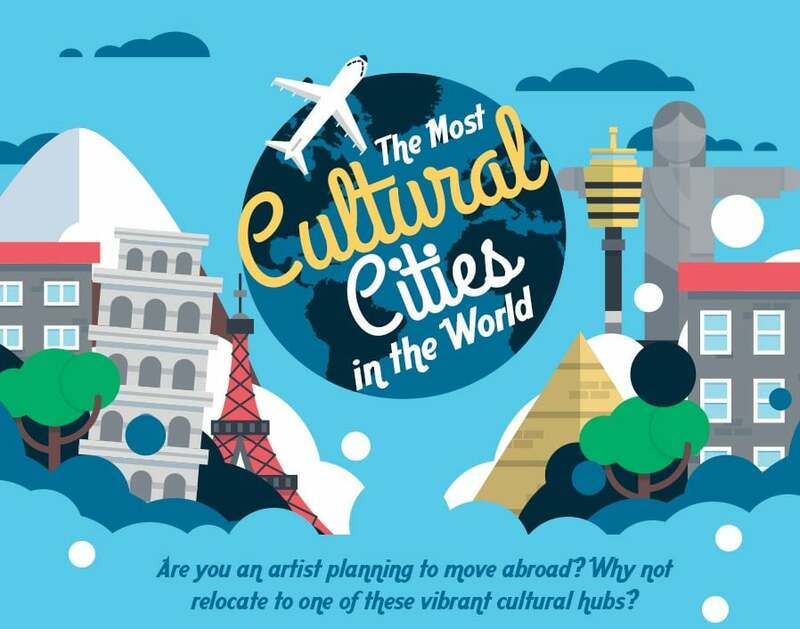 If you work in the arts and are considering a move abroad, we recommend that you take a look at this very helpful infographic from the team at Hansen & Company about the most cultural cities in the world. Each of these booming metropolises offer artists a wealth of inspiring cultural activities such as galleries, museums and theatres as well as great food and historical sites. This handy graphic also includes some useful information about the cost of living and the quality of life rating for each location. For example, theatre folk wishing to move abroad could do no better than London, England. Boasting almost 900 different theatres, this city has a fantastic theatre scene and is an ideal choice for aspiring stage actors, playwrights and directors. Painters and sculptors may be drawn to the jaw-droppingly beautiful and historically-rich city of Prague located in the Czech Republic. With just over 200 art galleries, it’s hardly surprising that this city was home to artistic greats such as Alphonse Mucha and Egon Schiele. Those in the culinary arts may want to consider relocating to that great centre of gastronomic culture - Paris. Home to over 100 Michelin star restaurants, the Parisian food scene still remains a world leader and chief innovator when it comes to haute cuisine. It offers many opportunities and much to learn for the budding chef, restauranteur or food critic. Take a look at the infographic below to find out more about the most cultural cities in the world.